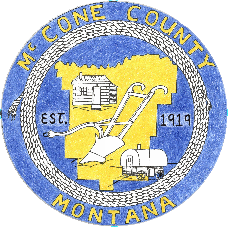 Established in 1919, McCone County was named in honor of state senator George McCone. It is located in northeastern Montana, south of the Missouri River. It is bordered to the east by Richland and Dawson Counties, to the south by Prairie and Garfield Counties, and to the west by Garfield County. McCone County encompasses 2,594 square miles. Circle is the single incorporated community in the county and also the county seat. Other communities include Brockway and Vida. McCone County seeks to provide quality services to its citizens with integrity, fiscal accountability, and positive leadership through encouraging public participation, communication, collaboration, and innovation in working to build a strong community.